3-Bolt vs. EZ Mount Garbage Disposals: What’s the Difference? 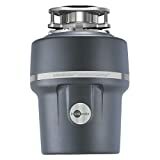 When purchasing and installing a new garbage disposal for your kitchen, there are two popular options for mounting hardware: 3-bolt assemblies, and easy-mount assemblies. Most homes with older garbage disposals have 3-bolt mount. For the sake of convenience you may decide to stick with what you have rather than changing the mounting bracket out. There are advantages and disadvantages to both types of mounting. However, there are key differences you should be aware of when making your purchasing decision. Let’s take a look at what sets these two mounting systems apart from each other. Then understand what you can expect when it comes to installing your new garbage disposal. This is the mounting system that has been used for most electric garbage disposal currently installed in modern homes built over 50 years ago. 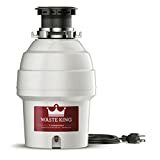 Waste King, one of the best garbage disposal companies, currently manufactures garbage disposals that use 3-bolt mounting, and they also offer EZ mount compatible models such as L-2600 and L-8000 as well. Some manufacturers made the switch to lighter aluminum mounts to save weight and reduce production costs. However, there are some advantages to a 3-bolt over an easy-mount. The primary difference is that 3-bolt mounts are stainless steel. It dampens more sound than EZ mounts, making them somewhat quieter in operation. Additionally, 3-bolt mounts have a sturdier build and can be fitted to closer tolerances with manual tightening on each bolt. The locking collar design of easy-mount systems isn’t exactly new. It is the only mounting method for high end Insinkerator-brand garbage disposals. 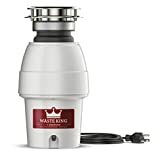 Waste King has disposals that can be installed via EZ mount, but there are no 3-bolt mounts for InSinkErator. InSinkErator such as Badger 5 or Evolution Compact only uses the EZ mount style which they call “Quick Lock Sink Mount”. You do not have to be worry if you decide to upgrade. InSinkErator is compatible with most three-bolt mounting assemblies. The key difference between EZ mount and 3-bolt mounting is that EZ mount systems are made of aluminum rather than stainless steel. The main reason for using aluminum is to reduce overall costs and the weight of the disposal. While some prefer the solidity and sturdiness and additional sound dampening of the 3-bolt, EZ mount disposals are often as quiet (if not quieter) as 3-bolt mounting. Overall, there is absolutely no difference between 3-bolt and EZ mount models in terms of motor and performance. The only differences between these two mounts are their materials and how easy to clean the disposal. Be sure to check what mounting your old garbage disposal has before you make a purchase. Then, prepare to swap out the sink mounting if you get an EZ mount system. Good luck with your new garbage disposal installation, and remember that installing a new disposal is an easy DIY upgrade that makes a big difference. Waste King vs InSinkErator – Which Brand is the Best Garbage Disposal?